The MyFuge™ Mini centrifuge is a personal centrifuge that virtually fits in the palm of your hand. Ideal for quick spin downs of microtubes and PCR tubes, the MyFuge™ is extremely easy to use. Simply close the lid and the rotor instantly reaches 6,000 rpm. Open the lid, and the rotor quickly decelerates to a stop for removing samples. 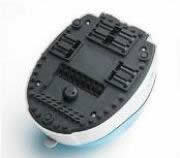 An increased capacity, eight-position microtube rotor is included and comes installed. Also included is a second rotor for 0.2 ml PCR tubes and strips which is stored (together with the rotor removal key) in a convenient compartment on the bottom of the centrifuge. When the rotor is not in use, storage in this compartment prevents loss or misplacement of the rotor. Available in five colors. 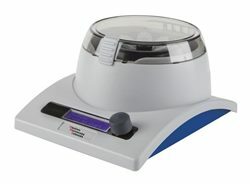 Dimensions 4.5 (W) x 5.9 (D) x 4.5 (H)"
The MagFuge is the industry's first high-speed centrifuge and magnetic stirrer, combined into one unit. This design innovation enables a substantial cost savings for labs by not having to purchase two pieces of equipment, a stirrer and a centrifuge, because the MagFuge does it all. The high-speed Centrifuge (12,500 RPM) is designed to give you maximum speed and flexibility while being comfortable and easy to use. The high-performance Magnetic Stirrer (3L Plus) is designed to provide a powerful magnetic coupling that ensures consistent accurate alignment of the stir bar that significantly reduce the chance of spin-outs. 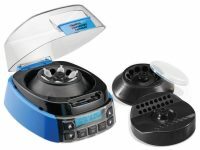 This compact centrifuge is ideal for most protocols calling for fast spins (up to 12,500 rpm / 9,800 rcf) and quick spindowns. Useful for PCR®, microfilter cell separation, clinical applications, and HPLC protocols. Operation is extremely simple for this high-level of sophistication. For duplicate spins, simply reload rotor and push Start. Designed with quick-spin option for commonly used 20-second spins. Includes a toolfree, quick-change rotor system. Safety features ensure the unit will not operate with an open lid, a jammed rotor or when out of balance. Efficiently designed for minimum bench top space. 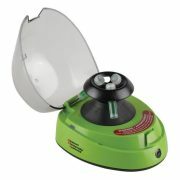 This is a powerful, quiet, centrifuge for table top use in small labs or offices. 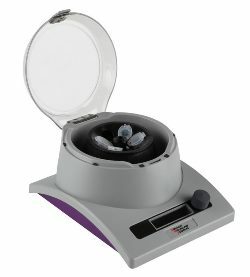 This compact mini-centrifuge is ideal for quick spin-downs from tube walls and caps. Use to microfilter cell separations and HPLC samples. Most spin last around 20 seconds, so Sprout® is designed for easy repeat opening. Ergonomically designed lid fits the palm of the hand comfortably. Operation is very simple: load tubes, close lid, press ON/OFFF button. For repeated spin, simply open or close the lid to operate. Internal safety switch ensure unit will not operate with lid open. 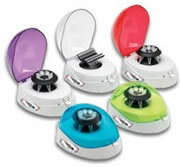 This personal centrifuge uses minimal benchtop space. Removable cord for easy storage. Unit is ETL, cETL, and CE marked and also complies with European RoHS directive. Circular rotors are glass-filled polycarbonate; straight rotor is unfilled polycarbonate. 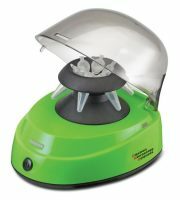 With an ergonomic design, the Sprout® Plus Mini Centrifuge has many features that bring increased efficiency to the lab. 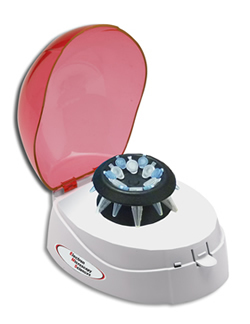 Tool-free SnapSpin rotors and quick-spin options make the centrifuges fast and easy to use. The lid was functionally designed to fit in the palm of the hand for easy repeat opening and quick tube extraction. A weighted rubberized base eliminates potential movement and dampens vibration and noise. The Sprout Plus is ideal for microfilter cell separations and HPLC samples, with adapters to accommodate all major microtube and PCR tube styles (1.5/2.0, 0.5, 0.2 ml) for customized use. The centrifuge housing is made from ABS plastic and lids are polycarbonate plastic enabling the unit to be easily cleaned. 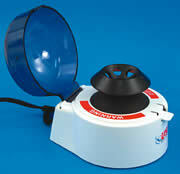 An ultra quiet, space saving centrifuge which is only 5 inches in diameter. This unit is ideal for use under the fume hood, or on any benchtop. It comes with a clear carbonate lid which is extra durable and allows visual inspection of the 6-place rotor while in operation. To start the operation of the unit simply close the lid; to open depress the plastic tab. The unit operates at 6400 rpm and 2000xg. 110 VAC. Suitable for use in the mini centrifuge. Polypropylene tubes with a captive plug; they are steam autoclavable at 250°F (121°C). The tube with the thumb tab! This pestle is ideal for resuspending lyophilized products or precipitates, or for homogenizing samples in a microcentrifuge tube. The "PTFE" pestle is mounted on a stainless steel shaft, 2.3mm (⅛") in diameter. It may be hand held or mounted in a motorized chuck. Overall length 143mm (5⅜"). 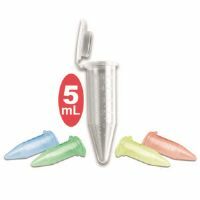 64785-05, 0.5 ml tube pestle, rounded tip cone is no longer available. Please see 64785-16. Our new 5 ml MacroTubes™ take all of the conveniences of standard 1.5 ml tubes and scale them up for larger volumes. These polypropylene tubes come with an attached cap that not only provides a tight, leak proof seal, it can also be effortlessly opened or closed with one hand. The cap is designed to provide a secure seal from -86°C to +80°C. CapLock Clips™ are available to maintain the integrity of the seal at extreme temperatures. In incubated/heated applications, it may be "boiled" for up to 10 minutes. At temperatures above 80°C, the use of the CapLock Clip™ is recommended. The tubes are made of maximum clarity, low-binding virgin polypropylene are are certified RNase and DNase free. Sterile tubes are also pyrogen free. They are sized to be compatible with all Benchmark™ (USA) and standard German-designed equipment, including centrifuges, dry bath block heaters, tube racks and thermal shakers/vortexers. The 16 mm tube diameter is identical to the diameter of standard 15 ml tubes, which ensures further compatibility with centrifuge rotors, etc. In many applications, these tubes have replaced 15 ml tubes, dramatically reducing plastic waste, storage space and shipping costs. The potential contamination of pipettor shafts is greatly reduced because the 56 mm total tube length (vs. 120 mm for standard 15 ml tubes) is short enough for standard 1 ml or 5 ml tips to reach the tube's conical bottom. Our new 5 ml Five-O™ screw cap tubes are made of maximim clarity, low-binding virgin polypropylene and are certified RNase and DNase free. Sterile tubes are also pyrogen free. They are sized to be compatible with all Benchmark™ (USA) and standard German-designed equipment, including centrifuges, dry bath block heaters, tube racks and thermal shakers/vortexers. Screw cap tubes are supplied with 20 mm OD caps that seal smoothly and completely with a single 360° turn. Useful from -86°C to 100°C, they are a valuable resource for boiling and for sample preservation at very low temperatures. Choose from non-sterile, bulk packaging with separate caps, or gamma sterilized rack packaging. 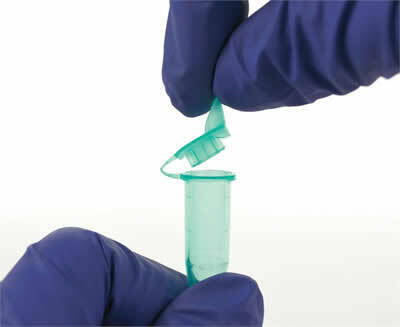 The foam racks are similar to the packaging normally associated with 15 ml tubes (upright woth caps attached), but require about 60% less storage space. 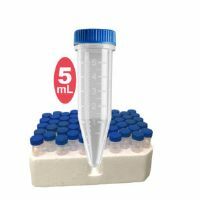 Conical 15 ml and 50 ml centrifuge tubes are made of premium polypropylene for clarity and centrifugal strength. They are supplied sterile, and although they are autoclavable, their polyethylene screw caps are not. Tubes and caps may be frozen at temperatures as low as -45°C. The maximum centrifugal force is 12,000 xg for the 15 ml tubes and 15,000 xg for the 50 ml tubes*. Caps have a flat top surface for easy marking. The Free Standing tubes have a "skirted" bottom that allows the tube to stand upright without a separate test tube rack. *Refers to liquids with a specific gravity of 1.0, using appropriate rotors, cushions and adapters. The same screw-cap conical tubes that you know and trust, repackaged into individual packets. 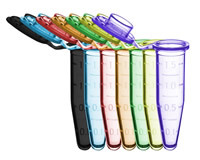 Individual tubes are sterile, DNase, RNase, and pyrogen free, and include high contrast graduations, a white "frosted" marking area, and caps with a flat top surface for easy marking and labeling. No more fumbling around with open bags or racks of tubes or wondering if the tubes in the bag you opened yesterday are still sterile. With the individual wrapping, each tube is sterile right up until the moment you open the convenient peel pack. Just as our standard bagged and racked tubes, the individually wrapped concial tubes are made of premium polypropylene for clarity and centrifugal strength. Tubes and caps may be frozen at temperatures as low as -86°C. The maximum centrifugal force for the 15 ml tubes is 12,000 xg, while the 50 ml tubes can reach 15,000 xg. Our new Oakridge Style Centrifuge Tubes are the economic choice for high speed refrigerated or non-refrigerated centrifugation. They are molded from durable, chemical resistant polypropylene and have round bottoms and consistent wall thicknesses for centrifugation at up to 50,000g when filled to 80% of their nominal capacity. Oakridge style tubes are autoclavable and re-usable and are designed with leakproof linerless closures. The SpectraTube™ is a new twist on a staple in the life science laboratory. 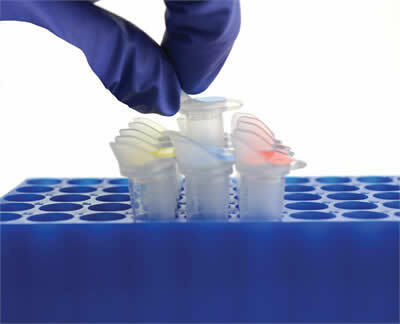 The proven designs of the 15 and 50 ml conical tubes have been reconfigured conveniently in a foam rack with five different colored caps to make sample identification a breeze. 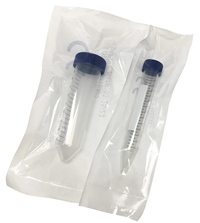 These tubes are perfect for any lab conducting multiple studies, day of the week studies, or any experiments requiring multiple sample types or solutions. All five cap varieties are flat, brightly colored, and frosted to make them easy to write on. In addition, the SpectraTubes™ are available in non-racked bags, with each bag containing a single cap color. 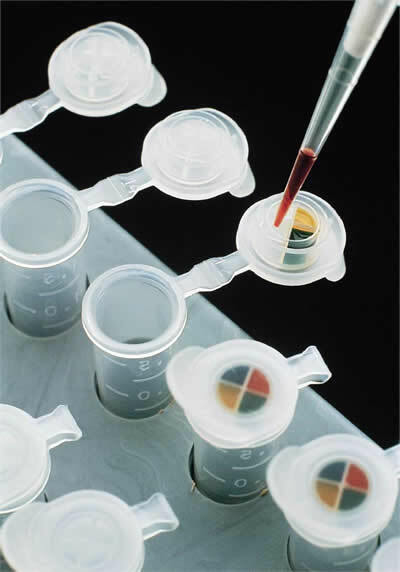 Tubes and caps are suitable for stem cell research and certified sterile, RNase, Dnase, pyrogen and cytotoxin free. Our SureSeal S™ microcentrifuge tubes are designed for a broad range of research applications, including enzyme digests, DNA isolation/purification, centrifugation, incubation and general sample/reagent storage. With a variety of design advances, SureSeal S™ tubes improve sample visualization, safety, stability and overall ease of use. SureSeal S™ tubes are manufactured under clean room conditions, using only BioClear™ co-polymer, an advanced polypropylene that maximizes clarity. BioClear™ has been formulated to be crystal clear, without compromising centrifugal strength (tested up to 28,000xg) or the usable temperature range (-90°C to +121°C). 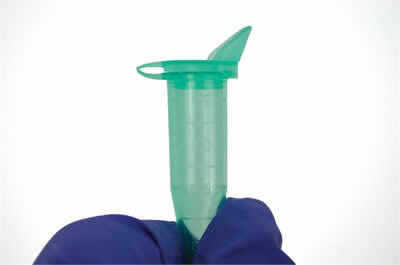 The oversized tube cap (with frosted marking surface), combined with the unique ring & groove closure, enhances the security of the liquid tight seal, while minimizing the required locking forces for a more ergonomic opening/closing of the tube caps. All SureSeal S™ tubes are RNase, DNase and pyrogen free. The new CoolCaddy™ keeps your reagents and samples cool, on the lab bench, without using crushed ice. Simply store your CoolCaddy overnight in any standard freezer and it's ready to hold temperature between 2° and 4°C for up to 5 hours. Vials, tubes, plates, strips and multi-channel reservoir solutions can all be kept cool while you perform your experiments. Dimensions: 17 x 21 x 4.5 cm / 8.3 x 6.8 x 1.8"
This pestle is mounted on a stainless steel shaft, 3.2mm (⅛") in diameter and it may be hand held or mounted in a motorized chuck. Double ended pestle. One end fits the 1.5 ml microcentrifuge tube and the other end fits the 0.5 ml tube. Overall length is 152mm (6"). 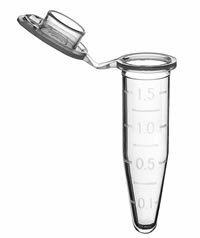 Economical - Disposable polyethylene pestles and 1.5 ml micro centrifuge tubes are used to resuspend precipitates such as protein of DNA pellets in buffer solution, or to grind soft tissue. The pestles are in a matched fit for the tubes. 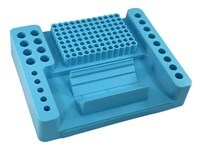 These sets are excellent for processing large numbers of samples. Pre-cut, peel-off, pressure sensitive labels. They are sized to fit microcentrifuge tubes, cryo tubes and many other containers. Available in two sizes: 1.28"x.5" (33x12mm) and 0.94x.5" (24x12mm). 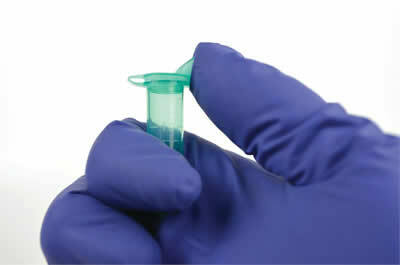 They are ideal for use with 1.5-2.0 ml and 0.5-0.56ml microtubes respectively. The labels are either clear (for sample visibility) or white. 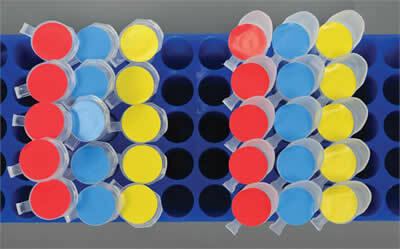 These round floating bubble racks can incubate 8 to 20 tubes in a beaker of water. Perfect for use in microbiology and immunology labs. Made to be used in beakers. The racks are loaded from the top and the tubes are easily removed by pressing the rack down on a bench until the short legs touch. Molded from buoyant foam-filled TPXR (polymethylpentene) with tiny bubbles throughout. 10.8mm diameter holes fit the 1.5 ml microtubes, and 7.7mm holes fit the 0.5 ml tube. The racks are¼"(6.4mm) thick with ¾" (19mm) long legs and a center rod handle. They are steam autoclavable at 250°F (121°C). Keep microcentrifuge tubes closed while boiling. Place the tubes in the rack, and then screw on the handle to hold down the cover. The handle is 5⅛" long, and assist's in the removal from hot beakers. Rack measures 3½" diameter and holds up to 16 tubes. This multi-tier tube rack has four rows of holes arranged at four different levels. The highest row can accommodate five 30 or 50 ml centrifuge tubes in either the conical or freestanding configuration. The second row can hold eight 15 ml centrifuge tubes. The third row has ten holes for 12 x 75 mm tubes. The front row has 12 holes for microcentrifuge tubes. Specially designed for applications where space is limited, but multiple size racks are required. Made of a heavy-duty, high impact polymer; this rack is truly versatile. This sturdy polypropylene rack holds 96 tubes in an 8 x 12 format. The rack provides easy access to each tube, even when 96 places are full. 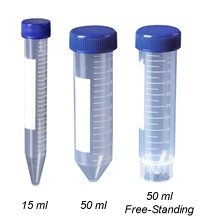 The transparent polypropylene lid has a snug fit and is tall enough to store most screw-cap microcentrifuge tubes. The rack measures 8-7/16" (L) x 4⅝" (W) x 2" (H) with lid.